Super Dragon Ball Heroes Episode 7 BEGAN the Universal Conflict Arc and now we have the STORY of this arc and TONS Of information revealed. We find out about the Core Area Warriors vs Universe 6 as we begin the SEQUEL to the Prison Planet Arc. I WISH Dragon Ball Super did this! UPDATE: Apparently they ARE Tsufurians / Tuffles from Universe 6... or at least Artificial Lifeforms FROM Planet Tuffle/Tsuru. INTERESTING! I was thinking something along the lines of 17 and 18 corrupted by Baby's race. Hey Geekdom101, thanks for all you do bro. I wanted to ask if you have any insight on the subject of the demon realm or demons in dragonball super? Sooo they're like baby but from U6 ? So universe 6 truffles huh? That's "???" Character is the girl right beside Zamasu in the poster idk how you didn't notice her lol. Called it. It was obvious. Just like U6 Saiyans look like shorter U7 Saiyans, these Tuffles look shorter than Baby so them being from U6 is very logical. Who is stronger? Vegito/Gogeta or Ultra Instinct Goku? So is Zamasu a completely different Zamasu? or is he pulled from the main timeline like Xeno Bardock? (that's how he's explained in xv2). but tuffles look like people? Baby is an AI too?? That ending of the previous episode was really stupid. They tried to mimic the ending of the Frieza arc where Goku is stuck on an exploding planet Namek, but now that Goku has IT, there's no tension there and he just comes across as acting overly dramatic. 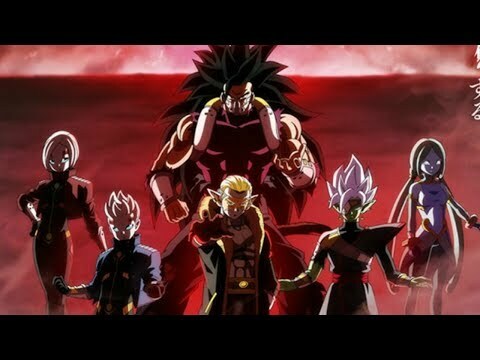 Just imagine them in the tournament of Power!!!!. They should do another tournament of Power , but you can team up with ANYONE FROM ANY UNIVERSE!! , Goku/Vageta/Hit/jarin/Broly!/And BEERUS!!!! Why didnt goku kiaoken and vegeta blue evolution did not showed up in dbs broly movie??? Is there going to be Ultra Instinct 2 and 3? Why Super Saiyan 3 Vegeta does not exist.